Many of you know that over five years ago a vision was established. 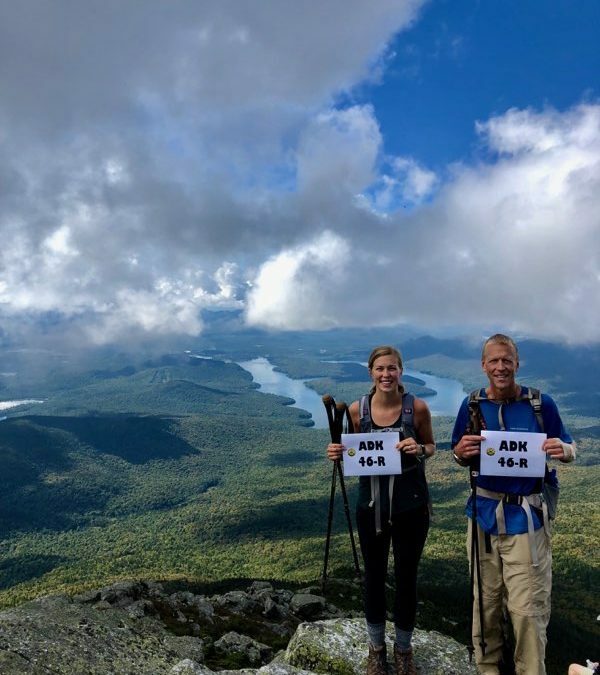 My daughter Morgan and I committed ourselves to summiting the 46 high peaks of the Adirondacks in upstate New York. On July 26, 2013, we summited the first of those high peaks: Cascade Mountain. We had no idea what was ahead of us or exactly how long it would take to finish. After a lot of progress, last fall with 12 peaks remaining, we focused that vision even further: We would accomplish this goal by the fall of 2018. Some of you know that I blogged about it shortly afterward, knowing that going public with the vision would add a whole new layer of accountability. On September 15, 2018, we stood together on the summit of Whiteface Mountain overlooking Lake Placid on the summit of our 46th peak. Vision accomplished. We are officially 46ers. I don’t recall another vision that I have given as much time to seeing realized. My bachelor’s degree took four years. My master’s degree took four years. My doctorate took three years. My advanced coaching certification only took two years. Becoming a 46er: five years, seven weeks, and two days. I’d like to share some really significant learnings about pursuing a worthy vision that I have gained from this experience. I believe these learnings will stay with me the rest of my life. In fact, I hope they do. And I hope they provide some good perspective for all of us in the visions we are pursuing. Early momentum and low hanging fruit was a vital way to begin the implementation of the vision. We specifically chose Cascade Mountain, a relatively easy and accessible summit that we knew would have incredible views, for our first outing—an early big reward. The excitement and passion this brought us for continuing propelled us onward. We needed the help and resources and experience of others. Blogs from those who had gone before us, equipment that was recommended and needed, and apps that guided us in the wilderness were all absolutely necessary. We would not be where we are today without relying on the wisdom, words, and guidance of others. We never stopped learning along the way. Almost every mountain brought new insights and learnings about equipment needed, dangers to be avoided, and challenges to be anticipated and prepared for. We often learned the hard way. One good example: just because it is summer at the base of a mountain, doesn’t mean it isn’t still winter at the summit. A big vision will face significant challenges and setbacks. I had to undergo knee surgery followed by seven months of rehab. I dislocated my shoulder on another peak, which took almost a year to heal. On three of the mountains we faced life and death situations on cliffs we were free climbing. You can’t control certain things when pursuing a vision, and with this vision the weather was a big challenge. Our vision was accomplished under extreme and less than ideal circumstances many times. Planning is really key. Sometimes we did this well, sometimes not. We knew certain peaks had to be summited at certain times of the year and under certain conditions. We mapped out our routes; we mapped out each trip; we mapped out each year. We budgeted for air travel and equipment. We started each mountain with an accurate estimate of time to complete the climb and made sure we began at the right time to have proper daylight—even if that meant starting out at 3 a.m. with headlamps. Planning for food, water, weather, temperature, and equipment was essential. A great vision without great plans is a recipe for failure. I want to close with a few more learnings that I believe in hindsight are the biggest takeaways for me in pursuing this vision. It’s who you take the journey with. Morgan and I were a two-member team. This accomplishment would have been empty and meaningless apart from my teammate. People are more important than tasks. Working together and never against each other is the only way to succeed. Celebrate. The most common question each of us get asked now is this: what are you going to do next? No one has asked us how we are going to celebrate or how we will recognize the significance of this accomplishment. Everyone has jumped to whatever the bigger and greater next thing is going to be. We are making a picture book. We are looking ahead to Memorial Day weekend 2019 when the ADK club gives a banquet and award certification to the newest crop of 46ers. We reminisce every time we are on the phone. We will be celebrating for a while—even though we are still going on with life. Don’t get me wrong, there will be more mountains and more journeys. But something special happened between a father and a daughter in the last five years that can’t and shouldn’t be captured by a quick high-five and an immediate turning away to a new “station” that constantly outdistance us. Something special happens in a team in the pursuit—they are galvanized, unified, and energized. They learn to love and work together in adversity and success. And that’s worth celebrating perhaps even more than the accomplishment of the vision itself. P.S. So many of you have been cheerleaders along the way. A big thank you to those of you who took the time to encourage me in the pursuit of this vision. The encouragement of others is part of what makes for a great vision experience. Image used by permission of Jeff Boersma. All rights reserved.